While Iran remains in compliance with the multilateral nuclear deal, known as the Joint Comprehensive Plan of Action (JCPOA), Iranian officials have repeatedly stated that Tehran will abandon the agreement if it is no longer in the country’s best interest. The SPV, announced by EU foreign policy chief Federica Mogherini and Iranian Foreign Minister Javad Zarif after a September meeting of the P4+1 (China, France, Germany, Russia, and the United Kingdom) and Iran in New York, is designed to preserve some of the sanctions relief envisioned under the deal. The SPV will set up a barter-like system for legitimate trade that avoids monetary transfers that would be subject to U.S. sanctions. The SPV is not yet operational but France and Germany have reportedly agreed to house the SPV, a positive step after several states said they would not host the special payment mechanism. The EU originally hoped the SPV would be running before U.S. sanctions entered into full effect Nov. 5. (See below for details.) The French Foreign Minister Jean-Yves Le Drian said the goal now is for the SPV to be functioning by the end of 2018. U.S. Secretary of State Mike Pompeo blatantly mischaracterized UN restrictions on Iran’s ballistic missile program when he accused Iran of violating UN Security Council Resolution 2231, which endorses the JCPOA, by testing a ballistic missile. The Dec. 1 statement says Resolution 2231 “bans Iran” from undertaking activities related to ballistic missiles “designed to be capable of delivering nuclear warheads.” The text of Resolution 2231, however, only “calls upon” Iran to refrain from such activities. The “calls upon” language is nonbinding and while Iran’s ballistic missile testing is troubling, it is not a violation of the resolution. Iran’s Foreign Ministry responded to Pompeo’s statement by saying its ballistic missiles are “defensive” and no UN resolution banned Iran’s missile program or missile tests. Pompeo’s statement came two days after U.S. Special Representative for Iran Brian Hook condemned Iranian ballistic missile proliferation and development while displaying several Iranian missiles at a military base in Washington, D.C.
Hook also highlighted Iran’s missile testing and development, including its testing of the Khorramshahr, a medium-range ballistic missile, in January 2017. Hook alleges that the Khorramshahr missile could be used to carry nuclear warheads. Testing the missile would be much more threatening, therefore, if Iran’s pathways to nuclear weapons were not blocked by the JCPOA. Hook’s assertion that the United States is in a stronger place to address Iranian malign missile activities without the JCPOA is misguided. The U.S. withdrawal from the JCPOA left the remaining parties scrambling to save the deal, leaving little time to focus on shared areas of concern, including Iran’s ballistic missile transfers. France, Germany, and the United Kingdom had previously been open to working with the United States to address Iran’s ballistic missiles but argued that the negotiations with Iran should be separate from the JCPOA. Iranian officials maintain that they are not interested in negotiating their ballistic missile activity. U.S. unilateral actions have only isolated the United States and reduced Washington’s credibility, making it significantly more difficult to address other Iranian actions of concern, including ballistic missiles. EU and Iranian officials met in Brussels Nov. 26-27 for the third High-Level Seminar on International Nuclear Cooperation. Discussions focused on Annex III of the JCPOA, which lists possible areas of technical and scientific cooperation, as well as nuclear safety and security. Unlike other sections of the nuclear deal, most of the proposed measures in Annex III are optional. During the two days of discussions, the EU and Iran reviewed past nuclear cooperation projects, including working with Iran’s Nuclear Regulatory Authority to ensure that it meets international standards, technical exchanges at the EU’s Joint Research Center, and workshops on civil liability. The EU and Iran also discussed ongoing modifications of the Arak reactor and conversion of the Fordow facility to a research site. The United States granted waivers from U.S. sanctions in November allowing work at these facilities to continue, which is necessary for the remaining P4+1 states to meet their commitments under the deal without penalty. Future areas of cooperation were also identified at the meeting. The EU and Iran identified seminars on governance frameworks and nuclear law and training on nuclear safety for future activities. Included in the nuclear safety basket was garnering support for a Nuclear Safety Center in Iran. The EU and Iran agreed at prior nuclear cooperation meetings to pursue such a center, which is mentioned as a possible area of collaboration in Annex III. It is unclear if the EU will be able to pursue all of the nuclear cooperation projects under discussion without additional waivers from the United States. When Pompeo announced the waivers for Arak, Fordow, and Bushehr, he did not clarify whether additional waivers will be forthcoming. A fourth high-level meeting will be held in 2019. On Nov. 5, the United States rolled out its second round of U.S. sanctions reimposed after Trump withdrew from the JCPOA in May, issuing oil waivers for seven states plus Taiwan as well as waivers to allow JCPOA-mandated nonproliferation projects to proceed. China, India, Italy, Greece, Japan, Turkey, Taiwan, and South Korea were granted waivers that allow them to continue purchasing oil from Iran at reduced volumes. To be eligible for a waiver, states must make a “significant reduction” in oil imports every 180 days and the president must also certify that the oil market can absorb the resulting reductions. The Trump administration also granted waivers for nonproliferation projects, namely to modify the heavy-water reactor at Arak and to convert Fordow into a research and medical isotope center. The waivers were necessary because to complete the projects, foreign entities are working with the Atomic Energy Organization of Iran (AEOI), which the United States returned to the sanctions list Nov. 5. 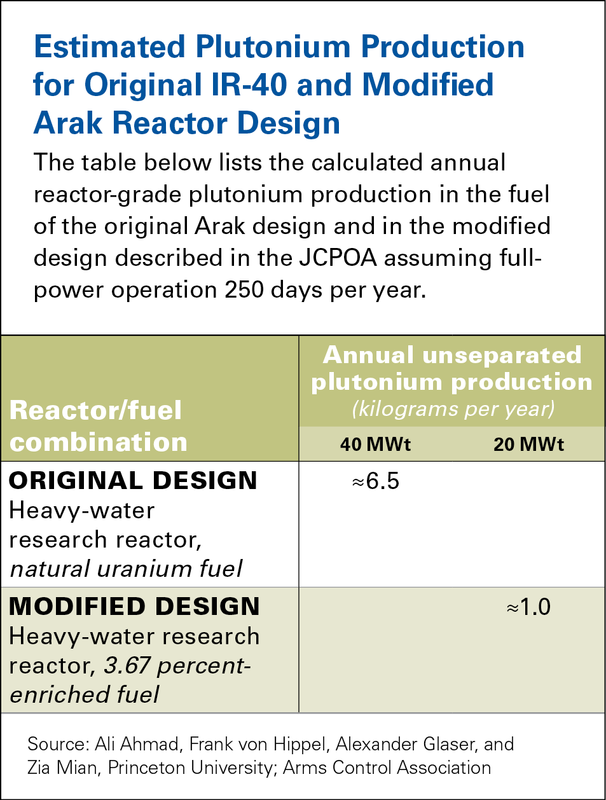 Under the terms of the JCPOA, Iran must modify its unfinished heavy-water reactor at Arak so that it produces significantly less weapons-grade plutonium on an annual basis than is necessary for one nuclear weapon; under the original design the reactor would have produced enough for about two nuclear weapons per year. Iran already removed the core of the reactor and China is assisting with the conversion work, as is the UK, which took over the U.S. role after Trump withdrew the United States from the deal. In addition to the Arak and Fordow projects, waivers were also granted for work at Bushehr. Russia provides fuel for the light-water power reactor at the site, is responsible for spent-fuel take-back, and is constructing two additional power reactor units. The sanctions reimposed Nov. 5 largely targeted Iran’s oil exports but also redesignated entities removed from the Specially Designated Nationals and Blocked Persons (SDN) list under the JCPOA and added another 300 to that list, including a number of Iranian banks. SWIFT, the Brussels-based financial messaging service used by banks worldwide, caved into U.S. pressure and severed ties with Iranian banks as a result of the United States returning most banks in Iran to the U.S. sanctioned list. SWIFT announced Nov. 5 it would again disconnect some Iranian banks from its system, saying its decision to suspend Iranian banks was “regrettable,” but necessary to maintain stability in the international banking system. The United States expressed doubts about Iranian compliance with the Chemical Weapons Convention at its fourth Review Conference in November, citing past Iranian declaration failures and voicing concerns that Iran maintains a chemical weapons program. The United States was the only country at the gathering of well over 100 states parties to express concerns about Iranian compliance. Iran immediately rejected the accusations in a right of reply, and also lobbed its own noncompliance charges against the United States, contending that U.S. unilateral sanctions threatened Iran’s access to peaceful applications of chemistry, including medicine, which is guaranteed to states parties under Article 11 of the treaty. The United States then cited three examples of Iran’s “declaration failures”: first, that Iran failed to declare its transfer of chemical weapons to Libya in the 1980s; second, that Iran has not declared all of its riot control agents to the OPCW; and third, that Iran failed to submit a complete chemical weapons production facility declaration, specifically a filling capability. The 2018 U.S. State Department report on compliance with arms control agreements stopped short of declaring Iranian noncompliance, stating as previous reports have that the United States “cannot certify” if Iran has met its obligations under the convention. However, U.S. Assistant Secretary of State for Arms Control, Verification, and Compliance Yleem Poblete has stated in several public remarks since taking office that Iran has a chemical weapons program, including most recently Nov. 2. “WMD allegations—by a country that supported Iraq’s use of CW against Iran; then invaded Iraq to allegedly rid it of them—is not just obscene, it’s dangerous,” tweeted Iranian Foreign Minister Javad Zarif Nov. 23. The International Atomic Energy Agency (IAEA) reported yet again that Iran is fully implementing its nuclear commitments under the 2015 multilateral nuclear deal. The agency’s most recent quarterly report, made public Nov. 22, demonstrates that Iran remains below the limits set on key nuclear activities and continues to cooperate with IAEA monitoring and verification activities. As with prior reports, the IAEA noted that inspectors have had access to all sites and locations in Iran that they needed to visit. The stockpile of heavy water is 122.8 metric tons, below the 130-ton limit. As of the last report in August, Iran had 122.9 metric tons. The nearly identical amounts are a result of Iran shipping out 1.7 metric tons of heavy water and using 1.5 metric tons for research activities that were monitored by the IAEA. Iran is operating no more than 5,060 IR-1 centrifuges at Natanz and withdrew 33 machines from storage to replace damaged IR-1s under IAEA monitoring. Iran’s stockpile of uranium enriched to 3.67 percent uranium-235 is 149.4 kilograms, below the limit of 300 kilograms of uranium hexafluoride enriched to 3.67 percent (which equates to 202 kilograms of uranium). This is a slight increase from the 139.4 kilograms noted in the prior report. Iran continues to implement the additional protocol and other transparency measures agreed to under the JCPOA. Iran’s operation of advanced centrifuges is in line with the JCPOA and the country’s research and development plan. No more than 1,044 IR-1 centrifuges are installed at Fordow, of which three were set up for research purposes, and no uranium was present at the facility. This was the first report issued since Israeli Prime Minister Benjamin Netanyahu charged in a Sept. 27 UN speech that the IAEA is not doing enough to follow up on information on Iran’s past nuclear weapons work that Israel removed from Iran and shared with the agency. Neither the IAEA’s report or Amano’s statement to the Board of Governors Nov. 22 referenced the archival material. Jackie Wolcott, the new U.S. Ambassador to the IAEA, did bring up the archival material and expressed confidence in the IAEA’s process for reviewing it in her Nov. 22 statement to the Board. Speaking at a Senate Armed Services Committee hearing on Dec. 4, Sen. Warren (D-Mass.) stated "if Iran maintains itself in compliance then I believe the president should reverse his reckless decision to withdraw from the nuclear deal and reimpose sanctions because the deal makes America safer and makes the world safer."